Don’t be a victim of termite’s costly destruction. Signature Service termite control combines a termite warranty on your home with a termite monitoring system designed just for you. In addition to an annual termite inspection of the interior of your home, we provide six additional inspections of the exterior of your home and the added bonus of our own termite monitoring system. This system allows us to detect termite activity on your property before they get inside of your home. When we detect activity, we make a precise application to stop termites dead in their tracks. Call us at 520-886-4146 or fill out our Customer Information Form for fast resolution to your termite problem. When you picture Arizona, what is the first thing that comes to mind? Is it historical sites such as Tombstone and Bisbee? Or the best of what Mother Nature has to offer in the form of the Grand Canyon or Sedona? Arizona is home to all kinds of climates and environments, making our great state a magnet for all sorts of visitors. People come from all over the world to experience what our great state has to offer. In addition to all the history and beauty worth seeing, however, our state also plays permanent host to some unwelcome visitors. We are talking about the dreaded termite. Most people don’t know and would never suspect that Arizona and termites go hand in hand. Due to the unique and temperate environments throughout the state, Arizona is able to support several different kinds of termites. There is one thing common to all types of termites living here in the southwest. They all have voracious appetites, and they all want to make your home their next meal. Many people native to Arizona are familiar with the running joke that there are only two types of homes in Arizona; those that have termites and those that will get termites. At University Termite and Pest Control, while we find that joke entertaining and amusing, we understand there is truth behind the laughter. Our more than 40 years operating in Arizona has taught us that punch line is about as accurate a statement as you can get when it comes to termites in our state. Termites cause incredible amounts of damage to homes in the United States every year. They generate more damage than tornadoes, earthquakes and fires….combined!!! Armed with this knowledge, every home and business owner in Arizona should act as quickly as possible to make sure their homes and buildings are safe and protected against termite activity. Why Is Termite Protection Important? It is understandable to doubt an insect as insignificant as a termite could be a legitimate threat to a structure as large as your home. When you have a few hundred thousand termites all working in conjunction, however, it becomes clear how one colony can destroy the structural integrity of a building in a short time. Having a pest professional treat for termites is imperative here in Arizona, and can actually preserve the value of your home. Think of treating for termites as a form of homeowner insurance. You are continually protecting your investment and the reward is invaluable. Recent studies conducted locally have shown that there are and can be as many as 12-18 termite colonies per acre. Now imagine having the peace of mind knowing University Termite and Pest Control, with all their years of experience and expertise, is your first line of defense against such a serious threat. You do not need to be an expert in pest control to gauge just how active termites are here in the southwest. Just take a walk outside and, knowing what to look for; you can see firsthand just how active termites are here in Arizona. The thin mud tubing you see trailing along in the dirt is how termites travel. If you see the same type of tubing on wood surfaces or trailing up the stems or bodies of plants or cactus, you can bet that structure is or has been a food source for a colony of termites. If you want to see termites live and in action, head out to the desert and find a downed tree or cactus that has not been disturbed for some time and turn it over. Just be prepared for the number of small white bugs that will go scurrying about! Even the United States Government knows that Arizona is a hotbed for termite activity. Just south of Tucson is one of their many testing sites. Run by the Department of Agriculture, this cutting edge facility is used to test and evaluate the effectiveness of new products formulated for termite control as they are developed. Call University Termite and Pest Control to arrange for a free, no obligation inspection. We perform thousands of termite inspections each year and, when it comes to termites, we know the best course of action for elimination. Early detection equals an easier solution when it comes to these pests. The good news if you don’t need to wait for termites to invade your home before you can take steps to avoid them. Are there really different kinds of termites in Arizona? Arizona is home to Subterranean Termites (the type that live underground and produce those familiar mud tunnels) and Drywood Termites (they dwell almost exclusively inside wood structures and create piles of “sawdust”). 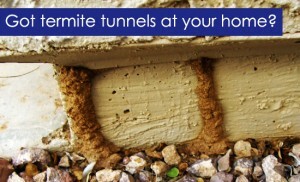 Subterranean Termites are by far the most prolific and can be found all over Arizona. Living in massive colonies, this type of termite constantly searches for new food sources. These colonies can be so large and builds tunnels so quickly that sometimes a new home under construction is decimated before it is even finished! Once a colony locates a suitable source of food, they begin to inflict significant damage to both the wood and drywall with their voracious appetites. The aptly named Drywood Termite also calls Arizona home. Since they are not as dependent on moisture as their subterranean cousins, most of their life is spent inside the wood they infest and devour. This termite tends to consume wood at a slower rate, but this does not mean that they do not pose a serious threat to the structural integrity of your home. The presence of this particular pest often goes undetected for long periods of time. All the while they are multiplying and spreading throughout and in all the wooden components of your home. The Drywood termite, as it digests, extracts every bit of moisture present in the wood it is eating. Believe it or not, dry wood provides enough liquid for a termite to survive with no other source for water. What remains after this process is a small pellet with slight grooves in its sides. When enough of these pellets accumulate in the cavities these termites create, the overflow then becomes an obvious and accurate indicator that this is the species of termite you are contending with. What can be done to protect my home from termites? The first step in protecting your home is to have a certified professional inspect the entire property for signs and evidence of termites and their activity. When you call University Termite and Pest Control, your technician will conduct an expert and thorough inspection at no cost to you, the homeowner. If you are fortunate enough to be termite free and have no signs of activity, an affordable and comprehensive protection plan can be established to prevent termites in the future. If termite activity is observed, your University technician will provide you with several options for treatment. For example, a customized monitoring program paired with an advanced treatment protocol can be implemented, attacking termite activity at or below ground level. This effectively stops the termites from further feeding while at the same time establishing a barrier to keep them away from your home. No matter what course of action you and your technician decide upon, you can be confident your treatment plan will be top of the line protection that is effective, affordable, and safe. University Termite and Pest Control uses Termidor HE in all of our termite treatments. While this may not be a familiar brand name to you, industry-wide it is regarded as the most effective, most efficient treatment in the elimination and prevention of termites. Termidor HE is a premium product and, when dispersed into the soil around your home, forms an undetectable barrier. This barrier prevents termites from entering the ‘safe zone’ that has been created around your home. In addition to being the superior treatment for any type of termite, Termidor HE is long lasting, continually providing protection to your home for years to come. Not only does University provide treatment options for both older and newer homes and businesses, we also offer effective Pre-Construction treatments that will prevent termites altogether. Outfitted with the most advanced treatments and equipment, we apply over 40 years of experience to work for you, implementing all the knowledge and know how into each and every treatment we administer. Your professional termite technician treats the soil beneath your home before the foundation is prepared and the concrete poured. Here at University, particular attention is paid to the more vulnerable areas around the exterior of your house to ensure your home will not become victim to termite activity.